I have a complex where I try to do everything on my own or by myself. Sometimes, a project crops up where the answer is, 'lol nope'. This is one of them. Cyno data. I may have begged and writhed about a bit hoping to get the cyno data released. I'd love to see a time lapse of the Eve map and the cynos popping up and going down as Phoebe released. I may have asked and begged a bit for that. I didn't get that exactly but I got something close. 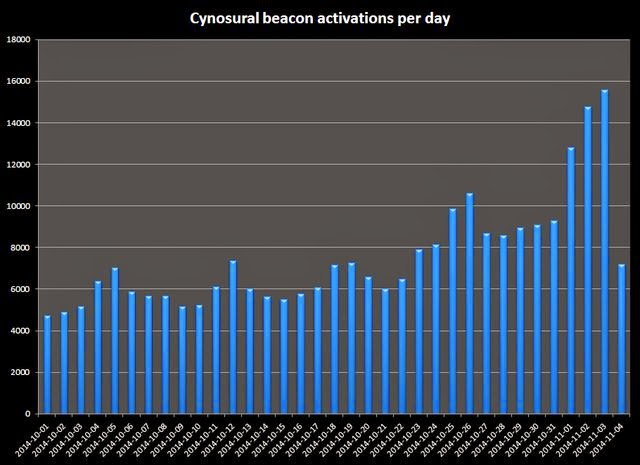 CCP Masterplan released the cyno data for the 35 days leading up to Phoebe. The information is there to be plugged in. I just can't do the plugging. Frustrating. He did include a graph which I have promptly stolen. Now i just need someone to make my beautiful imagery! Update: Mr Fuzzy Steve has made a first entry. I need to get him to make them blue.